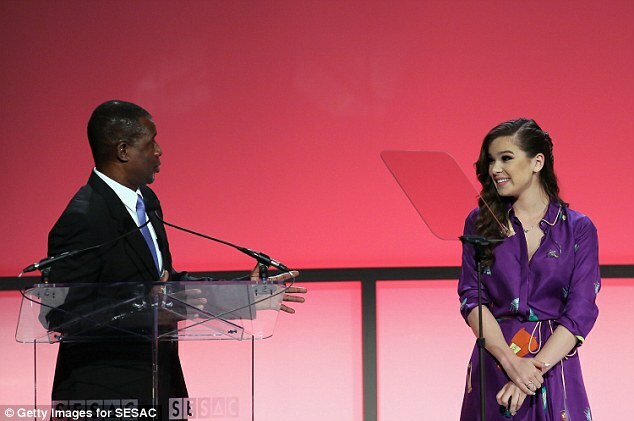 Hailee Steinfeld pulls off quirky chic as she poses at the SESAC Pop Music Awards. Actress and a talented singer, Hailee Steinfeld is quite known for her incredible sense of fashion. The Pitch Perfect 2 star showed off her fashion flair at the 20th annual SESAC Pop Music Awards in New York City on April 18, Monday night. The SESAC Pop Awards honor the songwriters behind some of the biggest songs of the past year. It also announces a songwriter of the year and publishers of the year along with other genre-specific awards. The 19-year-old actress looked chic in a shiny purple patterned kimono dress as she hit the red carpet. She opted for strappy black, orange and gold heels to pull off her quirky look for the night. She had curled up her long brunette tresses which were cascaded over her slender shoulders. She appeared to be sporting a shiny pink lip and smoky eye makeup on her pretty face. It turned out to be quite a busy night for the young star as she even performed an acoustic song at the gala event. It seemed the actress was having a great time at the musical event. She flashed a beautiful smile on her face while harmonizing on the microphone. Steinfeld even got the opportunity to share the stage with Trevor Gale, the Senior Vice President of Writer/Publisher Relations at SESAC. Steinfeld was spotted hanging out and chatting with another talented singer Charli XCX at the NYC event. They even posed for few pictures together. The 23-year-old singer Charli XCX was seen sporting a black pinstripe jumpsuit which featured a racy twist with its cutout detail. She showed off her toned tummy in the much racier look. The Brit singer finished off the look with black strappy heels and accessorized with a gold and silver choker. Many talented musicians and actors were seen attending the pop music awards on Monday night including Jimmy Napes, Swizz Beatz, Ayanna Ray, and Malavika to name a few.